OK so the Trev and Simon quote may be clutching at straws a bit, however with these super sturdy laundry trolleys you will be able to transport a whole load of duvets to your hearts content. Although it might not seem it, laundry trolleys are actually quite versatile, being used in an array of industries and premises across the UK (and even the world). These trolleys can be used to collect bedding, clothes, towels within the hospitality industry, and you will usually see these along hotel corridors during the day making sure everything is neat and tidy before the guests check in. These are also used in hospital environments, offering a large capacity to deal with the demand of beds needed in busy A&E rooms or private patients, making sure that the weight is evenly distributed for reliable use. The canvases are removable which allows the user to empty whatever the contents are directly without have to touch them again, ideal for stopping any dirt or bacteria are spreading. The steel base that the canvases rest on can take 150kg of evenly distributed weight and keeps the contents supported throughout their journey. 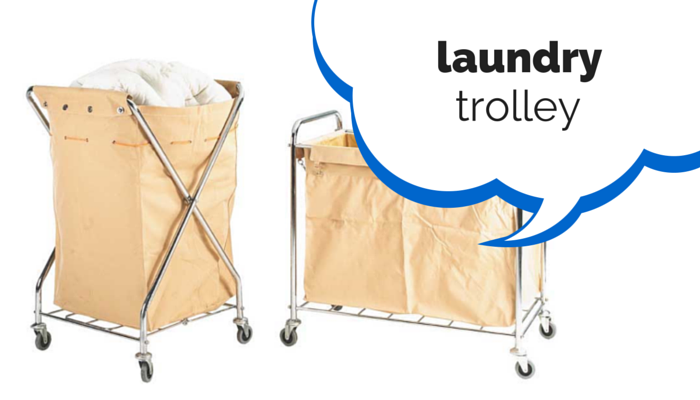 The laundry trolleys are available in standard or folding form, ideal for storing if space is at a premium. If you have any questions about our laundry trolleys, please give our sales team a ring on 0808 163 3704.